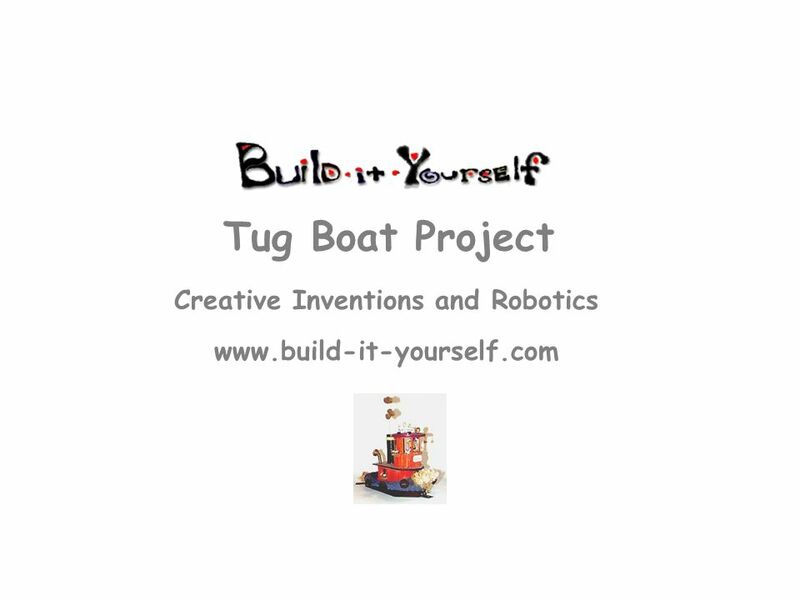 Creative Inventions and Robotics www.build-it-yourself.com Tug Boat Project. 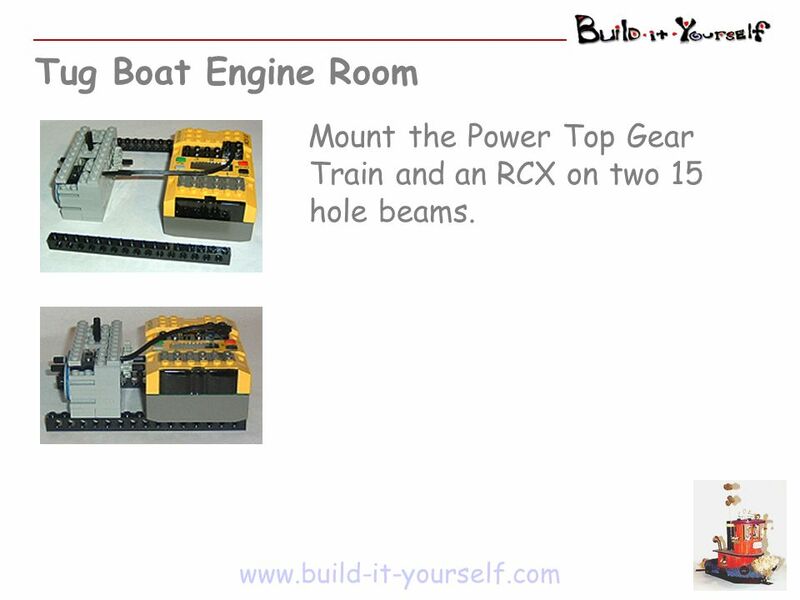 3 Tug Boat Engine Room www.build-it-yourself.com Mount the Power Top Gear Train and an RCX on two 15 hole beams. 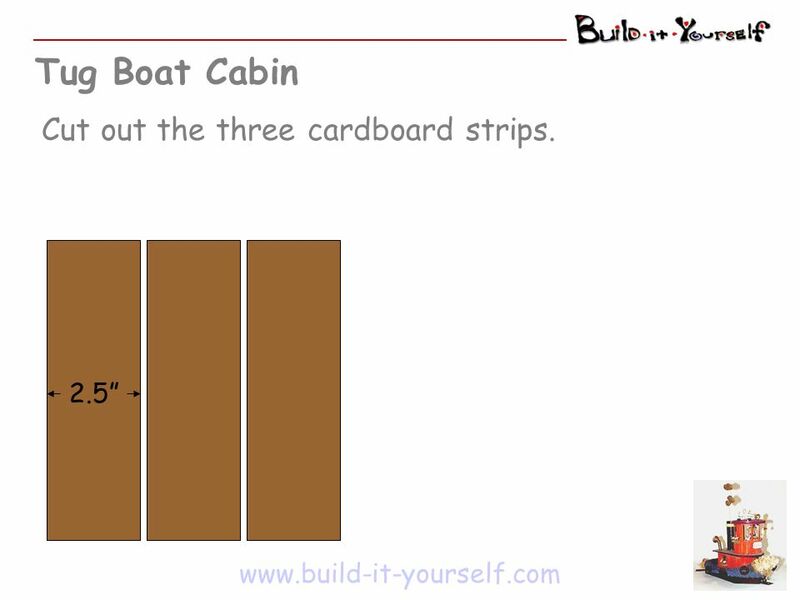 10 Tug Boat Cabin www.build-it-yourself.com Wrap the sides around the engine room. 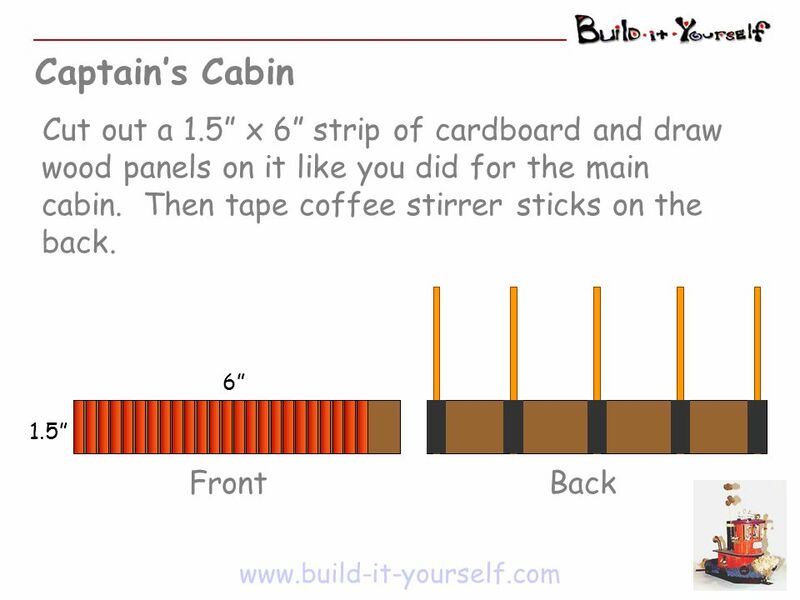 Glue Popsicle sticks on top to make the structure strong. 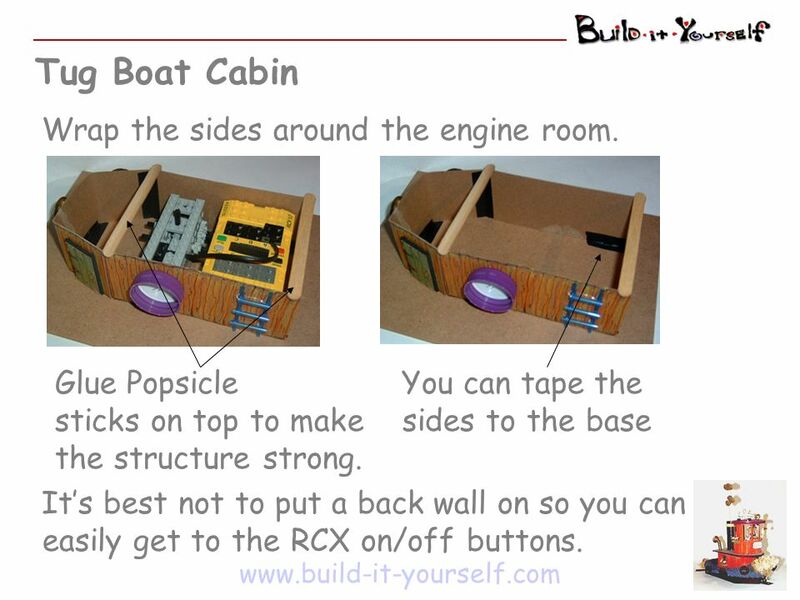 You can tape the sides to the base Its best not to put a back wall on so you can easily get to the RCX on/off buttons. 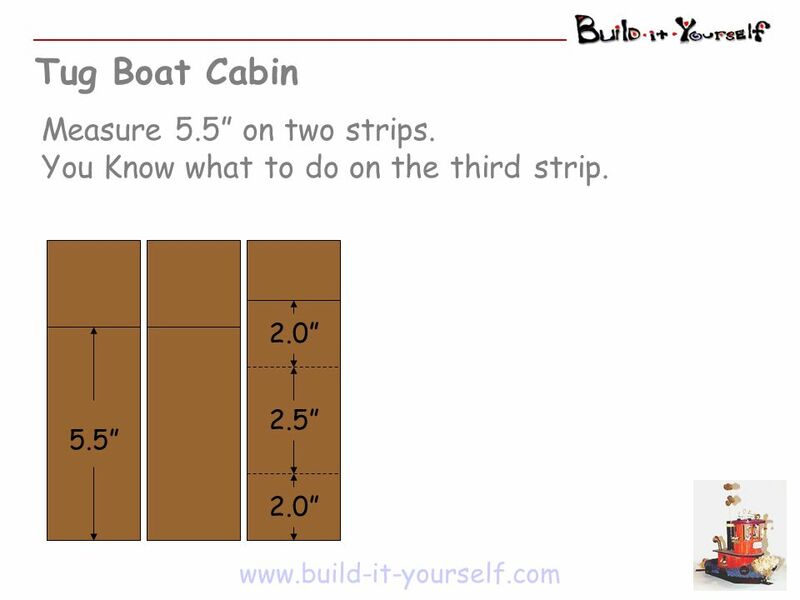 11 Tug Boat Cabin www.build-it-yourself.com Cut a cabin roof. 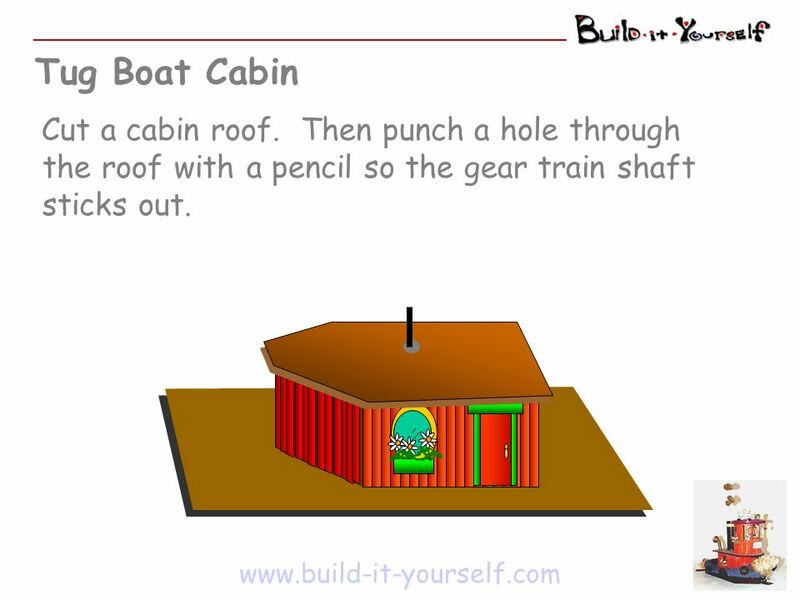 Then punch a hole through the roof with a pencil so the gear train shaft sticks out. 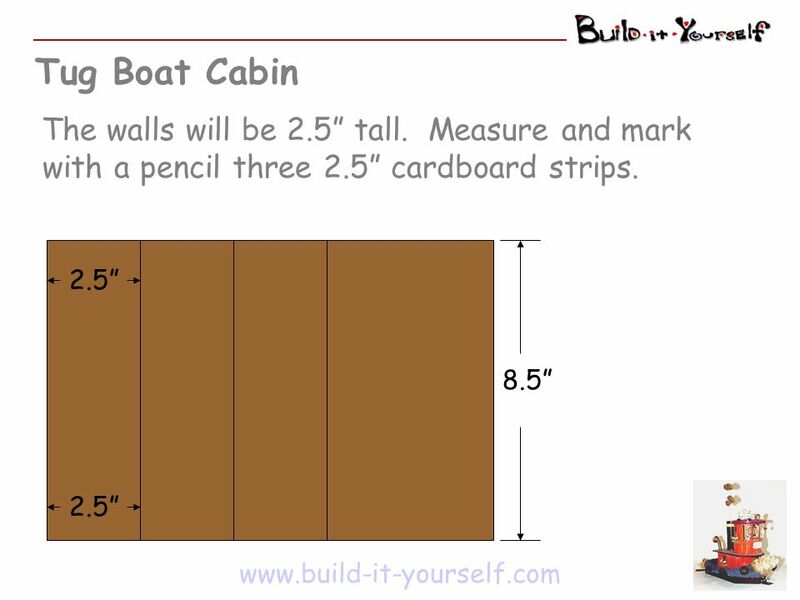 12 Captains Cabin www.build-it-yourself.com Cut out a 3 diameter circle or use 3 circular container lid. 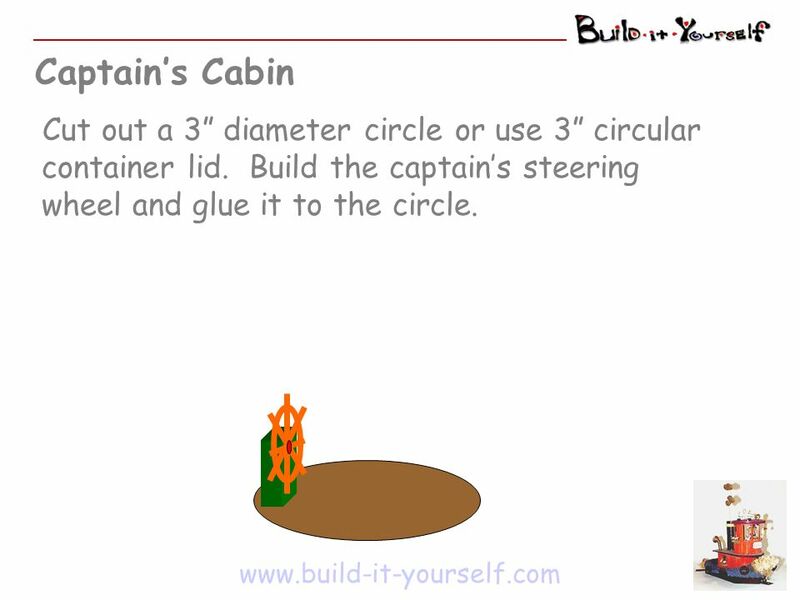 Build the captains steering wheel and glue it to the circle. 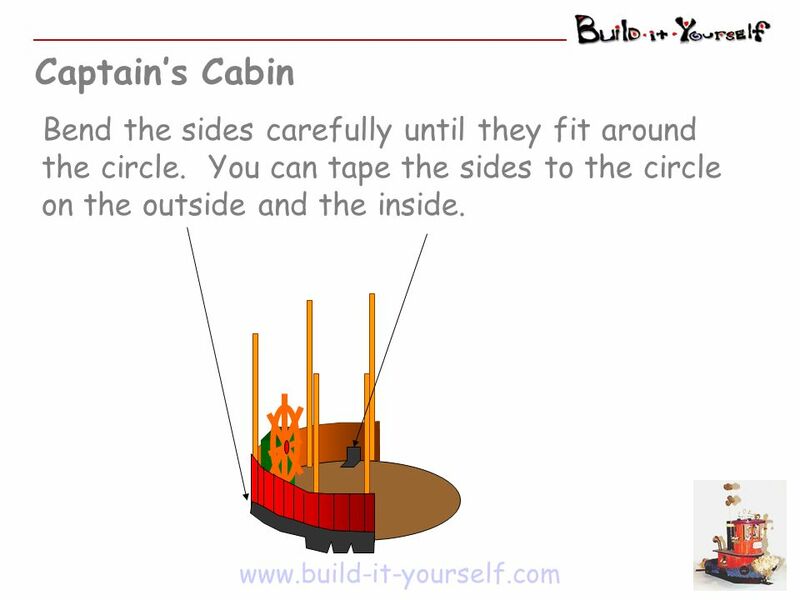 14 Captains Cabin www.build-it-yourself.com Bend the sides carefully until they fit around the circle. You can tape the sides to the circle on the outside and the inside. 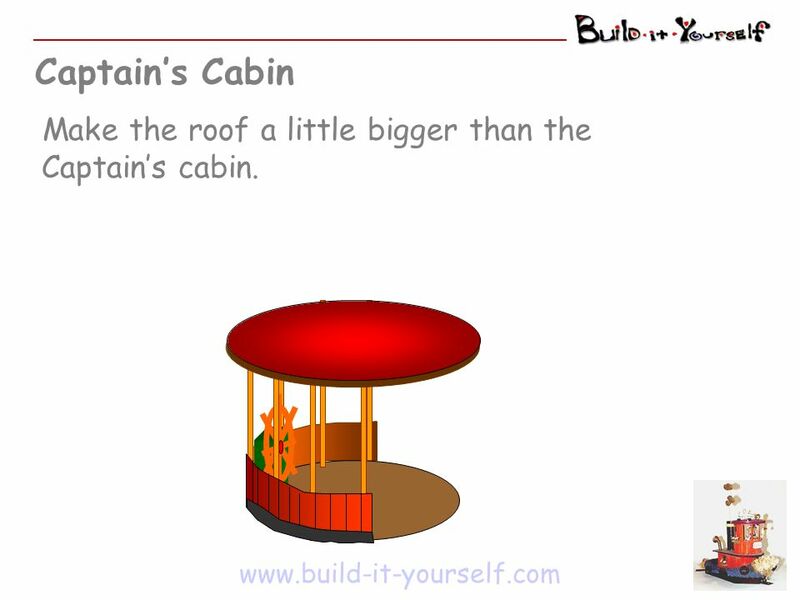 15 Captains Cabin www.build-it-yourself.com Make the roof a little bigger than the Captains cabin. 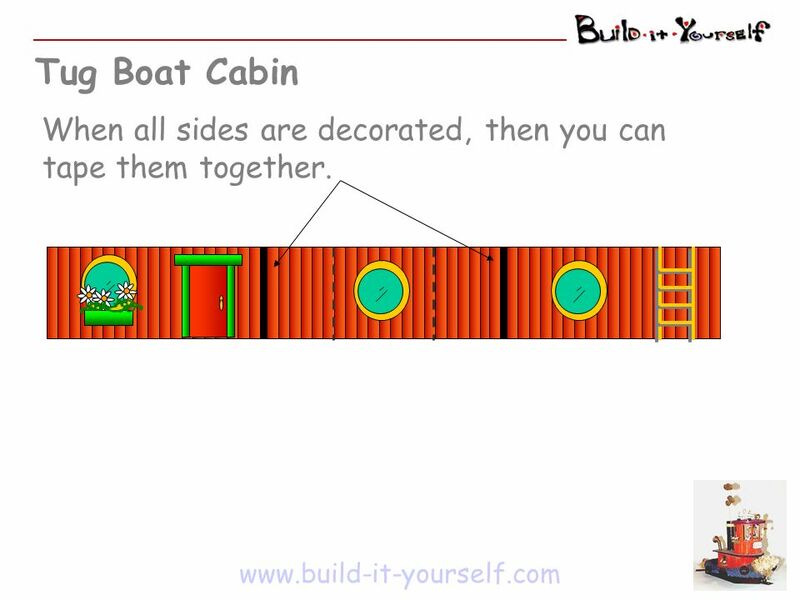 16 Tug Boat Cabins www.build-it-yourself.com Glue the Captains Cabin on top of the Main Cabin. 17 Tug Boat Sides www.build-it-yourself.com Cut and sculpt a 1 x 1 strip of foam rubber for the sides of the tug. 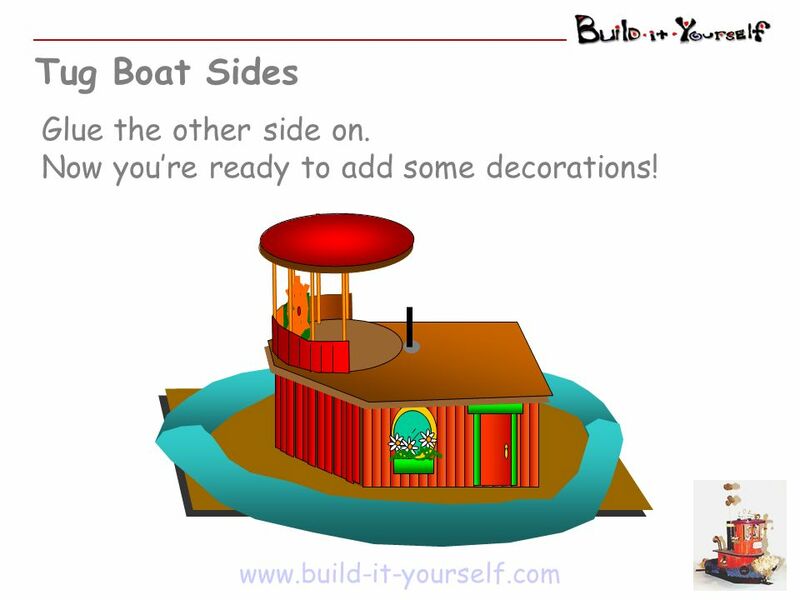 18 Tug Boat Sides www.build-it-yourself.com Glue the other side on. Now youre ready to add some decorations! Download ppt "Creative Inventions and Robotics www.build-it-yourself.com Tug Boat Project." 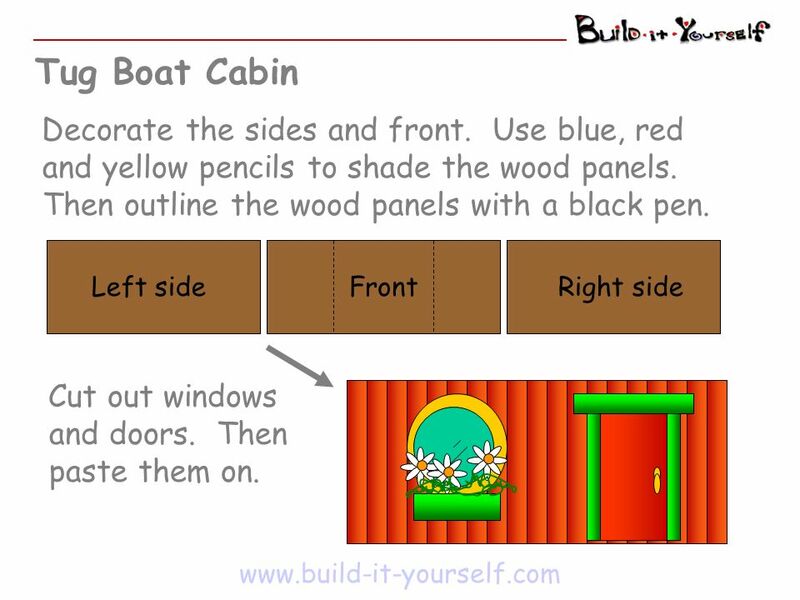 Your book A template A stick of glue Scissors Pencil crayons- blue and brown A pen. Organizing your Interactive Note Book Environmental Science and Biology Classes. D.T. 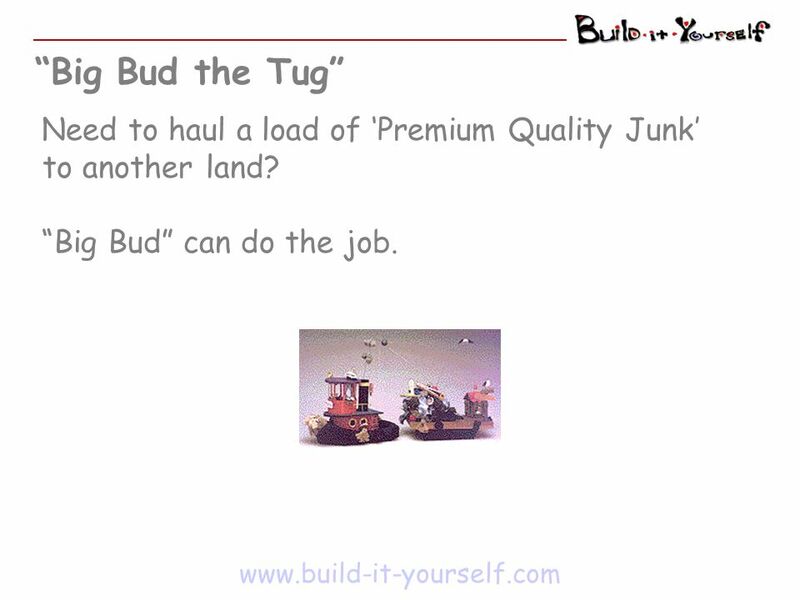 unit 5C: Moving Toys How to make a moving toy. 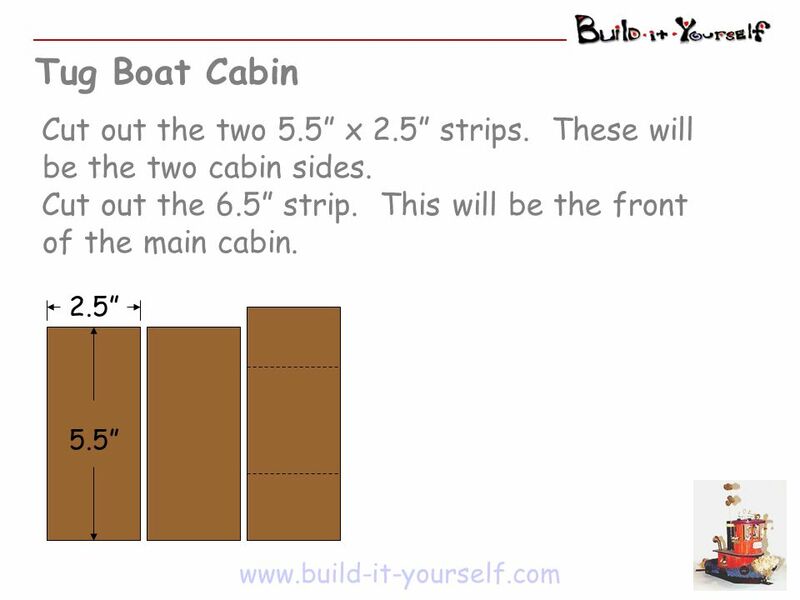 PAPER HOUSES Create a 3D House or Cabin. Foil Relief – Name Art 6 th grade – high school. What is a Relief? A relief is a flat sculpture. It can. NXT 2-Motor Car Adapted from Physics by Design, Second Edition, by Barbara Bratzel, College House Enterprises, 2007 MAXA ROBOTICS 2011. HOW TO MAKE A ROCKET BY SAM CANNINGTON. THE FUSELAGE 1.Cut out a thin peace of cardboard. How to make a Miners Lantern. Developed as part of… SURVIVNG STAVELEY. Craft 1: PUMPKIN HEADS MATERIALS: -Green Yarn -Oranges -Permanent black marker -Glue -Scissors INSTRUCTIONS: 1. Draw a fun pumpkin face on the oranges. BUNNY LANTERN. Place BACK of envelope on table in front of you, with flap up and open. How to Make a PAPER TIGER. STEP 1: MAKE BODY TUBE 1. Use a spent engine to roll your body tube out of copier paper the short way 2. Test the size by sticking. Our Bird Box How we made it. This procedure will inform and explain how we made our model bird house out of cardboard. We will also explain why we made.